Once your baby has their first birthday you will at some point start to wonder when your toddler progresses from having two day sleeps to one. At the age of 1 year, yes your toddler should still be having two day sleeps. The first one being about 1 ½ hours in length in the morning, this is likely to be about 2 or 2 ½ hours after they wake for the day. If your toddler wakes at 6.30am their first day sleep is likely to be about 8.30 or 9am. Look for the change in your toddlers behaviour and get them down. You are not looking for them to be really grumpy but looking for when they change from being nice to grizzly, this means it’s time for their morning sleep. Their second sleep is then again about 2 ½ to 3 hours from when they wake from their first sleep. In my workshop that I do for parents who have a 1 year old, I am always asked this question about when the sleeps progress from two to one during the day. My answer is that by the time your toddler is 18 months ( 1 ½ yrs old) they will have progressed and made the change to just one big day sleep in the middle of the day. It will be after lunch about 12.30pm. This sleep needs to be a decent sleep of about 2-3 hr in length. 40 mins or 1 hour simply isn’t enough. 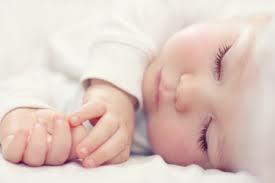 So somewhere between 12 months and 18 months you will notice that your baby starts to not sleep at the first sleep. Once you have waited and given them the chance for one sleep cycle which is 40 mins, then simply get your toddler up and continue your day. But be warned they will not make it to their normal sleep time of 12.30pm! By mid morning their reasonableness and patience will start to disintegrate. You will need to transition slowly by bringing their lunchtime sleep forward to late morning. This means lunch will also be much earlier too. This is likely to continue for a month or two until your toddler can cope with missing their morning sleep and last till lunchtime for one big sleep. Often when this change is happening they will not have their morning sleep for two or three days but then do so as they are just too exhausted to cope without it. It is a process and be patient and watch your toddler for signs of tiredness and within a month or two the two sleeps will have progressed to just one.